Luminal contents pass through this single layer of cells by either the transcellular or paracellular pathways. Transcellular passage is carrier-mediated or accomplished through passive diffusion, active transport, or engulfment by the cell membrane.2 Paracellular transport is regulated by protein complexes known as tight junctions that form a seal between cells.3 The permeability of this seal is regulated by zonula-occludens, intracellular proteins that connect the tight junctions to the cytoskeleton of the adjacent cells.4 The cytoskeleton is also made up of proteins, which comprise a network of thin, overlapping fibers known as the actin-myosin network.4 This partnership between the actin-myosin network and the zonula-occludens proteins controls the permeability of the tight junctions, and thus the intestinal barrier. Various forms of injury can occur to the intestinal barrier, including changes in the microbiome, epithelial cells, and/ or tight junctions themselves. Whenever any of these structural changes occur, the composition and function of the mucosal barrier are modified and there is a risk of increased permeability and an associated risk of gastrointestinal and extra-intestinal sequelae.3 As the awareness of this association expands, more and more non-invasive laboratory tests to assess intestinal permeability are becoming available. Lactulose Mannitol Test: The use of sugar molecules was one of the first non-invasive laboratory techniques for assessing intestinal permeability. The lactulose-mannitol, or differential sugar test, requires administering an equal, simultaneous oral dose of both a disaccharide (lactulose), and a monosaccharide (mannitol).5 The basis for this test is that mannitol, the smaller of the two sugar molecules, freely travels through the transcellular pathway of the mucosal layer, while the larger lactulose is typically restricted from paracellular absorption by tight junctions. Urinary elimination of these molecules is expressed as a ratio of the percentage of the ingested doses found in the urine, known as the LMR (lactulose mannitol ratio).5 The ratio identifies increased intestinal permeability. Secretory IgA: As a component of the gut-associated lymphoid tissue (GALT), secretory IgA or sIgA, is a major player in the body’s defense of its mucosal surfaces. Produced by stimulated B cells, sIgA inhibits the adhesion of intestinal antigens to the epithelium and induces other responses that promote mucosal homeostasis.11 Secretory IgA levels are affected by poor nutrition, antigenic load, stress, immune responses, and some pharmaceuticals. While not a direct marker of intestinal permeability, sIgA levels are useful to assess an increased risk of mucosal damage and disruption of barrier integrity, and are best viewed together with other direct laboratory markers. Saliva and serum tests are also available for measuring sIgA. Increased intestinal permeability can lead to poor absorption of nutrients and is being progressively recognized as a clinical phenomenon related to other systems. 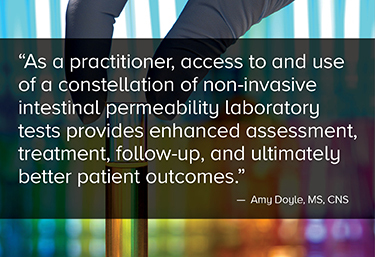 As a practitioner, access to and use of a constellation of non-invasive intestinal permeability laboratory tests provides enhanced assessment, treatment, follow-up, and ultimately better patient outcomes. Amy Doyle is a board certified nutrition specialist and owner of White Stone Wellness. She graduated from the New York Chiropractic College with her Master’s degree in Applied Clinical Nutrition. She is a member of the American College of Nutrition and American Nutrition Association. She currently has a private practice at Willow Health and Wellness Center in Baldwinsville, NY. Amy helps people with gastrointestinal health, food sensitivities, and metabolic health. Her approach considers the effect of the body on the mind as well as the mind on the body. She is also passionate about the crusade for schools to feed our children healthy, whole foods and is an advocate for establishing community gardens in areas of need. 1. Bischoff, Barbara, Buurman, Ockhuizen, Schulzke, Serino et al. Intestinal permeability-a new target for disease prevention and therapy. BMC Gastroenterology. 2014. 14:189. 2. Fasano, Alessio. Zonulin and Its Regulation of Intestinal Barrier Function: The Biological Door to Inflammation, Autoimmunity, and Cancer. Physiol Rev. 2011. 151-75. 3. Shen, Le and Turner, Jerrold R. Role of Epithelial Cells in Initiation and Propagation of Intestinal Inflammation. Eliminating the static: tight junction dynamics exposed. Am J Physiol Gastrointest Liver Physiol. 2006. 290:G577-82. 4. Viggiano, Ianiro, Vanella, Bibbo, Bruno, Simeone et al. Gut barrier in health and disease: focus on childhood. Eur Rev Med Pharmacolo Sci. 2015. 1077-85. 5. Mishra, A and Makharia, G. Techniques of Functional and Motility Test: How to Perform and Interpret Intestinal Permeability. J Neurogastroenterol Motil. October 2012. 18:4. 6. Vojdani, Aristo, PhD. For the Assessment of Intestinal Permeability, Size Matters. Altern Ther Health Med. Jan/Feb 2013. 19:1. 12-24. 7. Guo, Al-Sadi, Said and Ma. Lipopolysaccharide Causes and Increase in Intestinal Tight Junction Permeability in vitro and in vivo by Inducing Enterocyte Membrane Expression and Localization of TLR-4 and CD14. The American Journal of Pathology. February 2013. 182:2. 8. Lamprecht, Bogner, Schippinger, Steinbauer, Fankhauser, Hallstroem et al. Probiotic supplementation affects markers of intestinal barrier, oxidation, and inflammation in trained men; a randomized, double-blinded, placebo-controlled trial. J Int Soc Sports Nutri. 2012. 9:45. 9. Barzal, Szczylik, Rzepecki, Jaworska and Anuszewska. Plasma citrulline level as a biomarker for cancer therapy-induced small bowel mucosal damage. Acta Biochimica Polonica. 2014. 61:4. 615-31. 10. Semba, Shardell, Trehan, Moaddel, Maleta, Ordiz et al. Metabolic alterations in children with environmental enteric dysfunction. Scientific Reports. 2016. 6:28009. 11. Campos-Rodriguez, Godinez-Victoria, Abarca-Rojano, Pacheco-Yepez, Reyna-Garfias, Barbosa-Cabrera et al. Stress modulates intestinal secretory immunoglobulin A. Frontiers in Integrative Neuroscience. December 2013. 7:86.